Over 160 people registered for today's 16th Annual Bicycle Symposium sponsored by Bike Maryland. Several legislators stopped by to greet the crowd and voice their support for bicycle legislation and in one case, their opposition to the proposed helmet law. Jennifer Toole of Toole Design Group gave a good overview of some of the creative bicycle facilities being developed around the country in her presentation "Strategies to Increase Bicycling in the USA – What is Working?" Jennifer also suggested creating a symposium hashtag, #bikemd16. Check it out for more info about the talks. James Wilson, Executive Director of Bike Delaware, discussed how his state (with fewer residents than Fairfax County) has been able to use federal air quietly funds for bicycle projects. Staff from Bike Maryland discuss the Bike-MINDED program for teaching bicycle safety skills, and the Bike Friendly Maryland Program, dedicated to fostering bike friendly businesses, communities, and universities. A total of 4 paid staff work on these programs. Bike Maryland also has a paid Executive Director, Carol Silldorff. Mayor McClement of Frederick discussed the importance of bicycling to the economy of the city. He's an example of how political leadership can make a huge difference in creating a bicycle-friendly community. "It's not as hard as you think." Bicycle tourism is important. The local bicycle advisory committee created a very popular 10-mile Bicycle History Loop. The town also hosts the only penny farthing race in the country. Darren Flusche of LAB discussed the Bicycle Friendly America Program. Beverly Malone of the University of Maryland, a Silver level Bicycle Friendly University, talked about all the great activities underway there such as the bike lease program ($70/semester including maintenance, helmet, and lock), discounts on helmets, light giveaways, free U-locks, and bike raffles. They also hold a commuter challenge and provide free food at events (she noted the power of free popcorn to draw a crowd). Howard County Executive Ken Ulman talked at length about importance of cycling to his community and how he works with Bicycling Advocates of Howard County to make the community more bike friendly. He made the point that compared to most transportation projects, bicycle facilities are very affordable; a little money goes a long way. Delegate Cardin is founder and chair of the Maryland Bicycle and Pedestrian Caucus. He made the point that motorists need to slow down when they encounter cyclists and pedestrians. Motorists have a greater responsibility to be safe around vulnerable road users and to expect the unexpected. Speed definitely kills. Del. Cardin will be running for Attorney General and if elected his support for bicycling should have a very positive impact on cyclists in Maryland. Michael Sonnenfeld, Bike Maryland board member, discussed the Bike Maryland's legislative agenda. He hopes to modify Maryland's 3-foot passing law, which has an exception that severely limits the effectiveness of the law. It does not apply when "The highway on which the vehicle is being driven is not wide enough to lawfully pass the bicycle, EPAMD, or motor scooter at a distance of at least 3 feet." Bike Maryland has not taken a position on the controversial proposed mandatory helmet law, one senses due to lack of consensus on the board. Michael stressed the importance of developing the legislative agenda throughout the year to gain support and overcome potential objections early in the process. They solicit input on the agenda early in the year, and in the future they hope to get feedback online. David Ferraro, President of MORE, Mid Atlantic Off-Road Enthusiasts, discussed the great work being done by their volunteers. They have doubled their membership, currently at 1200 members, in the past two years. Thanks to support from SRAM and a private donor they plan to hire a full-time executive director while at the same time becoming an IMBA chapter. It was a good symposium and a model for what Virginia could do to bring advocates from around the commonwealth together to work toward a more bike-friendly Virginia. to the meeting despite the rain. Our outreach has expanded to four specific programs this year: the bike ambassador program, suburban outreach, east of the river (now in its third year), and Women & Bicycles. Membership in general has increased. We’ve launched a business membership program. D.C. has become the fourth best bike city in the country; your membership supports our advocacy, which contributes to D.C.’s high ranking. We’ll be shifting our advocacy focus from bike lanes and sharrows in general to protected, Green Lane Project-style dedicated infrastructure specifically. For the first time since WABA’s inception in 1972, we have a full-time advocacy staffer that’s not the executive director. We’ve had a success rate of 75 percent in our adult learn-to-ride classes. We also offer confident city cycling classes and have in-school clinics for kids. We received the latest version of the TBP Weekly Report, a publication of the National Capital Region Transportation Planning Board. The board oversees long-range transportation planning the greater metro area. In updating the plan they asked state and local agencies for their proposed additions and changes. From the list of changes and additions, it's encouraging to see that the District is proposing lane reductions and bike lane pilot projects. 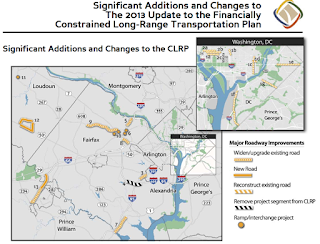 It's not so encouraging that Virginia's list contains mostly road widening projects and a new access highway to Dulles airport "to provide better access by car and truck to Dulles International Airport from Loudoun County on the western side of the airport." Where are the bike lane projects? Widen I-395 Southbound between Duke St. and Edsall Rd. I-495, Capital Beltway Ramps at Dulles Airport Access Highway and Dulles Toll Rd. VA 684, Spring Hill Rd. and VA 828, Wiehle Ave.
WABA members are invited to join the staff and board of directors for our Annual Members Meeting this evening. Vote in the board of directors' election and see presentations of upcoming programs and events by WABA staff. Light appetizers will be served. Please RSVP if you plan to attend so we can better prepare for the event. Tues., Feb. 26, 6:30 p.m. Location: All Souls Unitarian Church, 1500 Harvard St. NW, Washington, D.C.
We've written twice before about the closure of the Fairfax County Parkway Trail between Route 50 and Fair Lakes Parkway. According to VDOT's project website it was scheduled to "open by the end of 2012." It's still closed . This "temporary" closure has lasted for nearly a year. In August we pointed out a possible detour to the NoVa District bicycle coordinator and we didn't hear back (she was out on sick leave and her email went into a black hole). We also wrote to the person listed on the website as the construction manager, Oscar Jamilla, who never responded. In December Mimi Kronisch, who apparently is the construction manager, responded by email saying that VDOT would be "happy to sign a detour." I sent a possible route and she said they would look at it in the field and "get back to you in a day or so." I haven't heard back yet despite sending a followup email, and there's no detour. On January 18 I wrote to Del. Keam, in whose district this section of the trial lies, to complain. One of his staff called about two weeks later saying that VDOT said this was just a temporary closure and the trail would be open soon. Closing one of Fairfax County's major trails for nearly a year, with no detour, is unacceptable. An obvious detour was available. Even if that detour wasn't possible, VDOT could have created a detour had they wanted to, something that is recommended by their own policy. The Parkway overpass at Fair Lakes has been open for several months and still trail users in this area cannot use this commuting and recreational trail. We drove by the trail today and noticed that some paving work has been done but the trail will likely not be open for several weeks. This closure sends a clear message to cyclists in Fairfax; you don't count. It's too late now to do anything about this trail closure. We plan to find out why this occurred and to get assurances that it won't happen in the future. The Virginia legislative session officially ends today. This morning the Senate will be voting on the Transportation bill, HB2313, which earlier passed the House by a vote of 60-40. That bill will have a significant impact on bicycling in Northern Virginia, both positive and negative. Bike facilities will be included in most proposed local transportation projects. Many of those project involve road widening and major grade-separated interchanges, both of which often make conditions worse for cyclists. Sen. Chap Peterson who introduced dooring bill. We've compiled the following list of bike bills that were introduced in this year's Virginia legislative session, which ends today. See also a Connection article Virginia Lawmakers Strike Down Bike Safety Bills: Local cyclists vow return in 2014. Several bike bills were introduced at the start of the 2013 Virginia legislative session. Below is a brief summary of how they fared. See the VBF website for more details. SB 1060, Following too closely; passing other vehicles—Introduced by Senator Bryce Reeves, includes the three foot passing requirement. Defeated by House 42-Y 55-N.
HB 1950, Following too closely—House version of the bill. Introduced by Del. Alfonso Lopez, it removes a single word, "motor," from the existing bill. Engrossment refused by House (defeated). WABA is holding their Annual Members Meeting on Tuesday, February 26 starting at 6:30 p.m. at All Souls Unitarian Church, 1500 Harvard St NW, Washington, DC (map). "WABA members are invited to join WABA staff and Board of Directors for our 2013 Annual Members Meeting on Tuesday, February 26th. The evening will include elections for the Board of Directors and brief presentations by WABA staff about upcoming programs and events. Light appetizers will be served." If you plan on attending the annual meeting, please RSVP. Two D.C. Council members proposed legislation Tuesday to assess points on a motorist’s driving record for bicycle-related traffic infractions while also making it easier for bicyclists to move through intersections. In the first of what could be a series of bills in the coming years aimed at making bicycling easier in the city, council members Mary M. Cheh (D-Ward 3) and Tommy Wells (D-Ward 6) are seeking to amend the Traffic Act of 1925. If approved, for the first time, points could be assessed to a driver’s record if they are ticketed for failing to yield the right-of-way to a bicycle or are charged with colliding with a bicycle that has the right-of-way. A motorist could be assessed three to six points, similar to assessments for speeding and other major traffic infractions. The bill also requires applicants for a District driver’s license to demonstrate “knowledge of safely sharing roadways with pedestrians and bicycles” before being issued a license. And to clarify existing laws mandating that bicyclists abide by all traffic laws, the bill would permit bicyclists to cross through intersections “while following the pedestrian traffic control signal” unless otherwise directed. The bill comes as the city has installed 50 miles of bicycle lanes and plans to install five more miles per year for the foreseeable future. In recent months, some of the lanes have been blocked by ongoing construction projects, such as those on rapidly developing 14th Street NW. But the legislation will require contractors to “provide safe accommodation for pedestrians and bicycles” when a lane is blocked. SB1060, the bill to modify Virginia code to prevent motorists from following a bicyclist too closely, was defeated in the VA House by a vote of 42-55. The bill would have removed two words from the existing code text (46.2-816): "The driver of a motor vehicle shall not follow another motor vehicle, trailer, or semitrailer more closely than is reasonable and prudent, having due regard to the speed of both vehicles and the traffic on, and conditions of, the highway at the time." An earlier version of the bill removed only the second occurrence of the word "motor" which would have allowed a bicyclist to draft another bicyclist. Even with the removal of the second occurrence of "motor", bicyclists supported the bill. Thirty Democrats (all but one not voting) and 12 Republicans voted for the bill. A special thanks to delegates representing Fairfax who voted for the bill: Democrats: Keam, Plum, Bulova, Kory, Watts, Filler-Corn, Sickles, Surovell, Brink, Lopez, and Scott. Republicans: Comstock and Rust. Voting against the bill: Republicans: Albo and LeMunyon. Delegate Hugo did not vote. If your delegate voted in support of the bill, consider sending them a thank you note. Virginia remains the only states that do not have a following too closely law that applies to bicyclists. See more info about the vote at the Virginia Bicycling Federation site. Today I noticed a bicycle parked outside be right burger (brb) in Reston. On side is a sign reading "YOU BUY, I'LL FLY" and on the front is "BRB2U." I assume the deliveries are limited to the Reston Town Center area where brb is located. This is the second story about bikes in Reston we've published this week, both business-related. The first was about Ella's Pedicab that just started operating in the Lake Anne area. Could bike sharing be next? 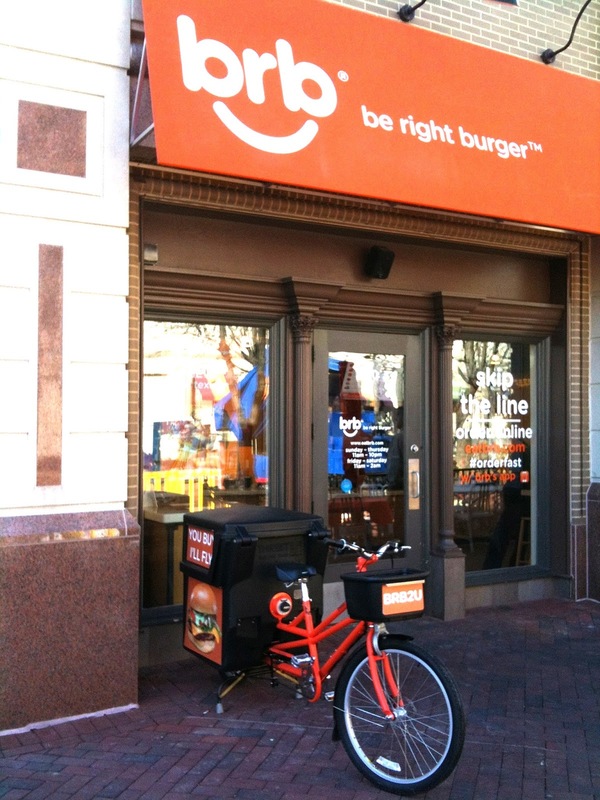 Ella's Pedicab is a new pedal-powered transportation service in the Lake Anne area of Reston. Owner Paul Walsh, a Lake Anne area resident for over 10 years, offers inexpensive rides in the Lake Anne area including riding to nearby Reston Town Center. We wish Paul the best of luck and hope that he joins us in our goal of making Fairfax more bike-friendly. There is a new method of transportation for Restonians - a pedicab is now running at Lake Anne Plaza. A pedicab is an environmentally friendly bicycle-powered rickshaw. They are popular in cities and in tourist areas, such as a beach boardwalk. Reston resident Paul Walsh recently opened up his new business - Ella's pedicab - and is offering rides in and around Lake Anne. Ella stands for "Enjoying Life at Lake Anne." "I have wanted one here for years," says Walsh, 53. "Now that the Metro is coming in, there might be potential for this form oif transportation." Walsh was out at Saturday's Freezin' for a Reason Virginia Polar Dip showing off his new pedal powered vehicle. He says he will regularly be out on the plaza offering 10-minute rides for $3 a person ($5 a duo). He will take someone as far as Reston Town Center or other Reston destinations. Fares are roughly a dollar per minute above the base price. Rides are $5 more after dark. He is also available for special events for $75 an hour. Want to take a ride? Call Walsh at 703-951-ELLA. Senate Bill 736 (the Dooring bill) was reported out of the House Trans SubComm2 this morning by a 4-2 vote, after a motion to Table by Del. Garrett of Lynchburg, seconded by the Chair Del. Cox of Hanover failed by the same vote. The bill now goes on to the full House Transportation Committee, where it will be heard next Tuesday, 1/2 hour after adjournment, which is usually about 2:15 – 2:30. Thanks to all who weighed in by contacting committee members, and all will be asked to weigh in over the weekend, as we are getting close to getting this bill passed. Senate Bill 1060/Reeves (3 foot passing and don’t follow too closely) has now been assigned to House Trans SubComm2, where it will be heard next Wednesday, 2/13 at 7:00 a.m. Unfortunately SB959, the bill that would allow local jurisdictions to place STOP signs at marked crosswalks, which we think would add confusion to existing code which requires motorists to yield to pedestrians and cyclists at marked crosswalks, was voted out of the House Transportation subcommittee by a vote of 6-0. Thank you, District of Columbia, for all the new bike lanes! My commute down L Street NW is now 15 minutes longer, and many cyclists still refuse to obey traffic laws such as stop signs and red lights. And thanks to how the District manages the traffic lights, my car each night never goes farther than about 200 feet to the next red light — crawling through the District at a snail’s pace. Each light lasts about a minute, so that adds another 20 minutes to my commute, because I hit about 20 of them. Also, thank you so much for the $125 ticket I received for doing 36 mph in a 25 mph zone. I’m not kidding — $125 for that. It’s small consolation that the District has since dropped the fine to $100. With all the millions the District is raking in from red-light and speed cameras, could it please hire an expert who knows how to manage traffic efficiently? And while you are at it, can someone repave the roads? The Feb. 2 letter from Laura Gore of Crownsville, “Commuting headaches in the District,” is a perfect example of how many motorists view the world. Ms. Gore is upset that “many cyclists still refuse to obey traffic laws such as stop signs and red lights,” then she complains about being fined for speeding in a 25 mph zone. Does Ms. Gore realize her bias? Bruce Wright, Reston The writer is chairman of the Fairfax Advocates for Better Bicycling. Here's the unedited version that includes a quote from Tom Vanderbilt on "modal bias:"
The letter from Laura Gore of Crownsville, "Commuting headaches in the District," is a perfect example of how many motorists view the world. Tom Vanderbilt of the book Traffic calls this modal bias, "thinking that one’s mode of travel is the 'normal,' even superior, one." Ms. Gore is upset that "many cyclists still refuse to obey traffic laws such as stop signs and red lights." She then has the gall to complain about being fined for speeding in a 25 mph zone. I doubt that Ms. Gore even realizes her bias, otherwise she would be embarrassed by her statement. Tomorrow, a transportation subcommittee in the Virginia State House will consider two very important bills which will greatly affect area bicyclists. Please take action immediately! Virginia SB736 would make it illegal in Virginia to "open the door of a motor vehicle on the side adjacent to moving traffic unless and until it is reasonably safe to do so." The bill will be heard tomorrow morning (Wed., Feb. 6) in the House Transportation Sub-committee #2. Please contact members of the committee ASAP (preferably before 7:00 a.m. tomorrow) and ask them to support SB736. Take action now. Virginia SB959 would allow local governments to adopt ordinances requiring users of shared-use paths to stop before crossing highways, even when no other parties are present. This bill needlessly introduces redundant regulation and excessive fines (even more than if a car ran a stop sign, in some cases!) and should be voted down. Please contact members of the committee ASAP, preferably before 7:00 a.m. tomorrow, and ask them to oppose SB959. Take action now. Thank you for acting on very short notice on both of these key pieces of legislation in Virginia. The Virginia State Legislative session is very short and bills move quickly. We try to only email you at critical moments. This is one of those moments. Thank you for helping to make Virginia safer! 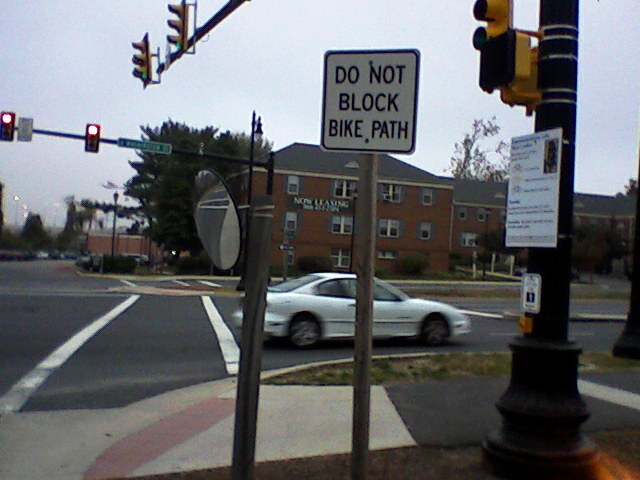 Current Virginia code states that trail users should not enter a crosswalk in disregard of approaching traffic. It doesn't require that we come to a complete, foot-down stop when there is no cross traffic. It doesn't require pedestrians and runners to come to a stop. We think the legislation is not needed and will be used by police to blame trail users when they are hit in a crosswalk by a motorist. On the W&OD Trail police have been known to ticket cyclists for not coming to a complete, foot-down stop at the trail stop signs, even when there is no crossing traffic. At least two of those tickets have been thrown out of court when contested. I have video of bicycle police who roll through the W&OD Trail stop signs, as do 95% of cyclists when there is no cross traffic. SB959 will make the signs enforceable. We think that's a bad idea. You probably have a stretch of your usual ride or commuter route that worries you more than the rest, like a blind curve or a busy crossing. Mine is just a mile from home, near where Richmond Highway (U.S. Route 1) crosses the Beltway at the gateway to southern Fairfax County. 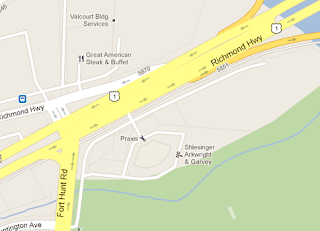 The bicycle-pedestrian side trail that runs alongside Richmond Highway crosses an entrance to the Hampton Inn parking lot and continues through the intersection with Fort Hunt Road. The side trail is only a few years old, built as part of the Wilson Bridge Project. Soon after it opened, I found that cars making the right on red at Fort Hunt Road and cars exiting the parking lot at the Hampton Inn routinely drove across the side path, looking to their left to turn into northbound Richmond Highway traffic but never looking to their right for bicycles or pedestrians coming southbound on the trail. So as you come to these crossings, even with the right of way or the green light, you never know if a driver will pull out and hit you. In 2011 I asked Fairfax Police to do some enforcement at the Fort Hunt Road intersection. The officer who went to the location observed a constant flow of cars running the red to turn onto Richmond Highway. I thought that some new signs and notices might make drivers more aware of the hazard, so I spent most of that year working (not very effectively) to get Fairfax County and Virginia DOT to take a look at the intersection. When I met with a staff member of Supervisor Gerry Hyland’s office and a VDOT employee at the site, I brought this photo of a sign from the City of Alexandria. I also suggested that this sign, plus a yellow line down the middle of the crosswalk at Fort Hunt Road and a painted crosswalk at the parking lot entrance would make the point that those crossings carry two-way traffic. VDOT, which controls Fairfax County’s roads, will not post any sign not on its approved list and the one I suggested isn’t on it. The VDOT technician also said he could not paint a yellow stripe on a crosswalk. Instead, VDOT and Supervisor Hyland’s office offered to make three other changes: move the "Yield to Pedestrians / $200 Fine" sign on Fort Hunt closer to the intersection, where it was more likely to be seen by drivers thinking about turning right on red; paint the crosswalk with stripes; and install another "Yield to Pedestrians / Fine" sign at the Hampton Inn entrance nearby. But after a few months, when none of those things happened, I checked back to find that Fairfax County had decided that they couldn’t do any of the things they had agreed to. Exasperated, I asked Supervisor Hyland’s office what they could do, and the staff person said she would talk with Fairfax Police about stepping up enforcement. That was May of 2012. Every day that I commute home from work, I’m extra watchful of right-on-red drivers and cars crossing the side trail. But last month, on January 4, I was hit by a car entering the Hampton Inn parking lot. The driver didn’t see me riding along the trail, although I had on a reflective vest and two headlights. I didn’t see his turn signal, if it was on. When his car turned towards me, I slammed on my brakes but couldn’t get out of his way in time and when he hit me, I flipped up onto his car’s hood. Thankfully, I am okay. The driver did the right thing and seemed genuinely sorry about the collision. My bumps and bruises healed and I’m looking forward to getting back on the bike when the repairs are done. The bike needs a lot of work but the driver’s insurance company is taking care of that. But Fairfax County, VDOT and Fairfax Police all failed me and, in a sense, they also failed the driver. When VDOT and Fairfax County have been made aware of a serious safety hazard to cyclists and pedestrians, why have they done nothing about it? Instead of ignoring, then rejecting a number of ideas for improving safety at these crossings, I would like for authorities to make it their problem and come up with some solutions. VDOT and Fairfax County authorities should have to answer why nothing has been done to alert drivers that they are crossing over a bicycle and pedestrian trail. When a bicyclist is on a bicycle-pedestrian side trail and gets hit by a car, why does the police officer say the bicyclist shouldn’t ride on the “sidewalk?” The officer came up with several excuses, like a broken streetlight and the questionable effectiveness of reflective vests, for refusing to cite the driver for the collision. The driver that crossed a bicycle path and struck a cyclist was not cited. How can that be right? 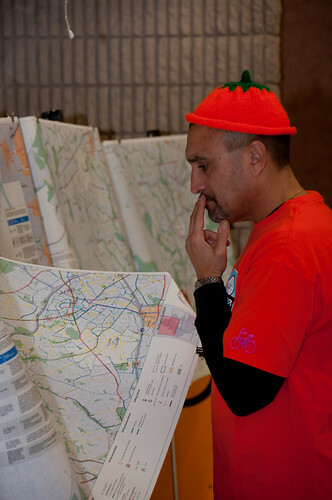 It took longer than planned but we've uploaded a number of new photos taken at the Fairfax Bike Summit held in October of last year. Check out the FABB flickr pool to see the new photos. Many thanks to photographer Sue Carter for taking some great photos. Bicycle Action Day was held on January 29 in Richmond. The purpose was to show support for bicycle legislation being considered in the Virginia legislature. 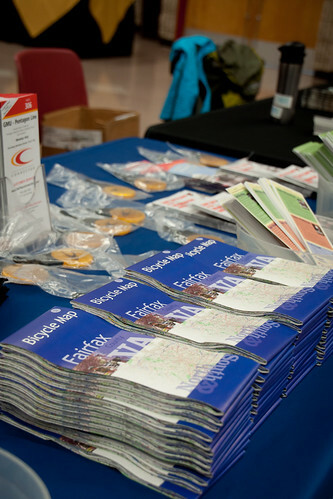 Ride Richmond sponsored the event and recently published a recap including several photos. Several Northern Virginia legislators were present including Delegates Keam, Lopez, and Peterson and Senator Favola. About 15 bicyclists — members of RideRichmond, a nonprofit organization of bicycle enthusiasts, and their supporters – met on the Virginia Commonwealth University campus and biked to the General Assembly building to demonstrate support for legislation that would require drivers to give bicycles more room on the road. “Many cyclists are also drivers. We’re not just a special interest group, and we’re not here to talk about an ‘us vs. them’ mentality … We believe cycling is a nonpartisan issue that simply makes sense,” RideRichmond co-founder Michael Gilbert added. The group praised the work of Sen. Chap Petersen, D-Fairfax, along with Sen. Bryce Reeves, R-Spotsylvania, and Del. Alfonso Lopez, D–Arlington, all of whom have bills that target specific issues bicyclists face in their daily rides or commutes.